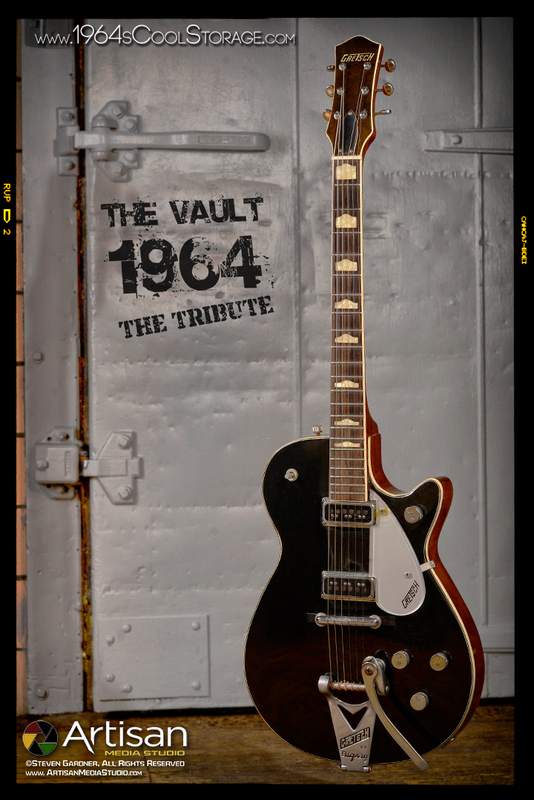 The Gear of 1964 The Tribute: "The Best Beatles Tribute on Earth"
©2019 Roy Davies, Inc. / ©2018 3rd Alternative, Inc.
From 1961 to the spring of 1963, George Harrison used a 1957 Gretsch duo Jet guitar for live performances and recordings. He used this guitar on such songs as, "Please, Please Me'. 'I Saw Her Standing There', 'Twist And Shout', 'Please Mister Postman' and several other songs from the Please Please me sessions, Decca recordings and early BBC recordings. It has a distinctive clear powerful tone that cuts sharply on the bridge pickup and is full and rich sounding on the neck pickup. The guitar pictured here, also made in 1957, is the guitar we used in 2001 when we attempted to faithfully recreate a Beatles lunchtime show at the famed Cavern Club in Liverpool, England during 'Beatle Week' that year. It's one of the many pieces we brought across the pond to visually and sonically achieve our goal. Original black lacquer finish, DeArmond pickups, Gretsch bar bridge, wiring harness, Bigsby tailpiece and Gretsch hardshell case. Strung with Pyramid flat wound strings, this guitar played through an original 1961 fawn tolex, black panel Vox AC30 put our guitarist on this project, Jimmy Pou, that much closer to feeling and hearing what a teen aged George Harrison felt and heard. The closer you get to these sounds, the closer you want to get!